Stay Right Here a Little While...: KING CRIMSON'S "RED"
King Crimson are an amazing prog rock band who were at their peak in the late 1960's early 1970's. Their best album is their final release of the 1970's, "Red"(1975). After "Red" they disbanded and would not reform until the early 1980's. "Red" is a masterpiece of prog rock/metal, light years ahead of it's time. The album is very dark, dissonant, and brooding. With only five tracks, "Red" packs a heavy punch with Robert Fripp's unique guitar playing conjuring up sounds that have never been heard before or since. Bill Bruford's bizarre yet solid drum playing and John Wetton's excellent bass work hold everything together perfectly. It is embellished perfectly with sprinklings of horns, woodwinds, and violin. 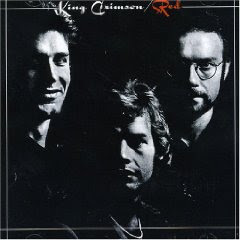 King Crimson pulled off something that is very hard to come by in the world of progressive rock. They made an album that is just as much complex and devastating as it is accessible and immediately enjoyable. A rare accomplishment indeed. The first track, "Red" is a dissonant yet irresistible dark instrumental track that showcases Robert Fripp's ability to carry a strong melody and still sound strange as all get out. The next two tracks, Fallen Angel" and "One More Red Nightmare" have melodic vocals but bizarre drumming and rhythms and dark chords, making for a frightening listening experience. "Providence" is a spacey, instrumental, incidental track with violin that sets a quiet yet evil mood. The final track, "Starless", is a masterpiece, possibly the best song King Crimson has ever written. It starts out as an easy going mellotron driven ballad and slowly builds with a simple ascending quarter tone repetitious guitar pattern that keeps escalating until you are about to go insane, then it explodes into an all out nightmarish finish that always gives me goose bumps. If you only hear one King Crimson album in your life, let it be this one. You won't be disappointed, and I'm sure you will want to hear more. Here's the beautifully devastating first track, "Red".